Good morning readers! I have another super cute holiday treat for you today. 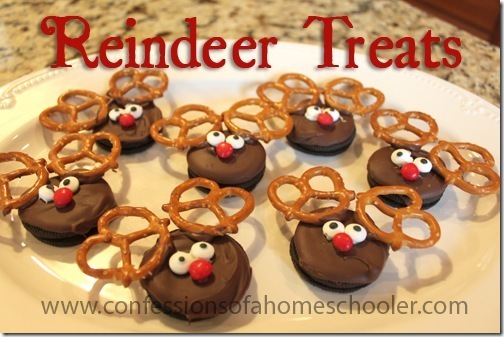 These adorable reindeer snacks are not only easy to make, but they make great treats to bring to any holiday festivities you might have going on! And they’re really easy enough that your kiddos can do them too. If the video doesn’t work for you , click here to watch the Reindeer Treat tutorial! Melt 1 c. chocolate chips in the microwave on 20 second intervals stirring in between until melted. Drizzle chocolate over the top of your Oreos and let harden in refrigerator for about 10 minutes. Once chocolate is hardened, melt another 1/2 cup or so of chocolate chips and use that to attach the pretzel horns, candy eyes, and nose. I hope you enjoy this festive snack idea, and let me know if you give it a try! Hello Erica! These are so cute and I just had to try them. We made them yesterday and I took them to my ladies Bible study group for our Christmas party! They were a big hit and everyone took some home to their own kids! Thanks so much for sharing them! Merry Christmas! Where did you find the candy eyes? I’ve checked my stores with no luck at all. Thank you for sharing these. I made these with my daughter and her friend. They are grade school age, and we had a blast. We watch you – tube via the Amazon FireTV, since I’ve subscribed to your channel it is on my list as we scan through. My 5 yr old Youngling has been watching all your treats you’ve made and BEGGED me to make them. I finally had time to do it today. He was so happy!! Lol. I just added the candies and pretzels to the melt chocolate instead of using icing though. Just wanted to say thank you.